It was an exciting day for Adventure Riders. The most anticipated new Adventure Bike in years was about to be revealed to a crowd of press in Milan, Italy at the EICMA show. 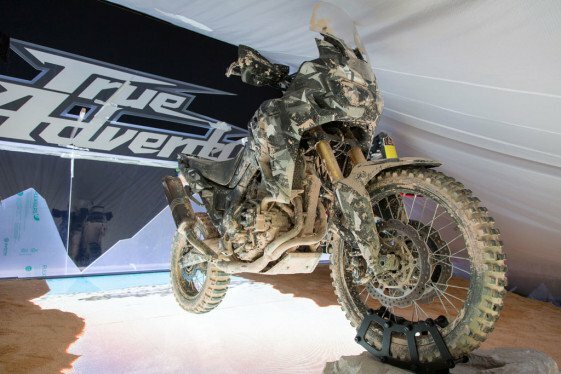 Strangely, as the curtain dropped, what appeared to be the new Honda Africa Twin was displayed wearing camouflage and covered in mud, as if it had just been rushed to the stage after a trail ride. It seems all the mud was Honda’s way of emphasizing how serious they are about their new Africa Twin being a dirt-oriented Adventure Bike. Honda states the new bike is inspired by their adventure heritage and recent Dakar rally racing program. Sharing the stage was the 1989 Paris-Dakar winning NXR 820V Africa Twin and the Honda CRF450 Rally used in the current Dakar Rally. via New Honda Africa Twin Finally Revealed at EICMA? » ADV Pulse.